When American Marcos Giron (25), ranked outside the Top 300, started this tournament by losing a 1st set TB to Andrea Collarini, he probably wasn't thinking "It's ok, that'll be the last set I lose this week." And yet, that's exactly what happened, culminating in an impressive 4 and 4 win over Challenger heavyweight Darian King (26, Barbados) in the final. This was Giron's first ever Challenger title and he gained 50+ ranking spots. King, the runner-up, was the top seed. 2nd seed was Mitchell Krueger (24, USA) who lost in the first round. 10th-seed Rogerio Dutra Silva (34, Brazil) got the win here, defeating 2nd-seeded Casper Ruud along the way, as well as 8th-seed Mats Moraing (26, Germany) in the final. Moraing had defeated top-seed Lorenzo Sonego earlier. This is RDS' 11th Challenger title. He is now 34 ranking spots away from Top 100. Viktor Troicki was in this draw, unseeded. He lost in the 2nd round to Oscar Otte (25, #169, Germany). Dan Evans attempted his comeback from ban here, but lost his first match to Kamil Majchrzak (22, #176, Poland). Henri Laaksonen was 15th-seed here, but lost to 2nd-seed Ruud in the 3rd round. Another first time titlist on the Challenger tour, Sweden's Mikhail Ymer (20) wins here over the USA's Noah Rubin (22, #141). Ymer moved 59 ranking spots with the win to enter the Top 200 for the first time in his career. He defeated top seed Delbonis in the semis, while Rubin defeated an unseeded (but resurgent?) Donald Young in the same round. However, Rubin was defending champ here, so he actually dropped 6 ranking spots from this result. Tommy Robredo was 13th-seed here and lost in his first match to Elliot Benchetrit (20, #271, France), who then went on to be routined by Delbonis in his next match. Stephane Robert was 10th-seed, who lost his first match to Dustin Brown, who then lost immediately after to Gregoire Barrere. Yuichi Sugita was 4th-seed and lost in the 3rd round to 15th-seed Jurij Rodionov (19, #208, Austria). There were just a couple $25Ks to start the year. 3rd-seed Anna Kalinskaya (20, #166, Russia) won Playford, beating 6th-seed Elena Rybakina (19, #182, Kazakhstan) in the final. Of note is Greete Minnen (21, #348, Belgium) who lost here in the first round, but then followed it up by not only qualifying for Hobart but winning her first ever WTA Tour match there. And in Hong Kong, we have a champion who is just 15 years old, Ukraine's Daria Lopatetska. She beat Barbora Stefkova (23, #301, Czech) in the final to win her first $25k title, all without dropping a set. She has two previous $15k titles, both from last year. Could this be a promising WTA newcomer in a few years? She was unseeded here, as was runner-up Stefkova. Poland's own promising young-gun (and the country's top player), Hubert Hurkacz (21, #76) continues to march unstoppably toward the Top 50 by winning the 3rd Challenger of his fresh career. He was the #2-seed here and didn't drop a set until the final against 4th-seed Ilya Ivashka (24, #84, Belarus). "Double H" also beat 3rd-seed Jiri Vesely in the semis with little trouble. RCB was the #1 seed here and lost in his first match to Harry Bourchier (22, #435, Australia). Is the name Jeffrey John Wolf one we'll all have to keep an eye on this year? This 20-year-old from the USA was nearly outside the Top 400 when he got a WC to enter this tournament. Then he did the unthinkable and won it! He's now up to #290 in the world. After dropping a set to 15th-seed Gianluca Majer (24, #275, Italy) in the 2nd round, Wolfe won his next three matches while dropping only 7 GAMES! That includes a double-bagel over 2nd-seeded Canadian Filip Peliwo! Holy crap! Wolfe then defeated another shocking upstart in Denmark's Mikael Torpegaard (24, #297). This was Wolfe's first Challenger title and, in fact, he only has 1 Futures title, so this result was highly unexpected. What will he do going forward? Meanwhile, in Vietnam, the fresh-faced newcomer who won the first-ever Da Nang Challenger is..... Marcel Granollers. I... don't think I need to tell you all who this is, do I? He's a former Top 20 and is now close to regaining direct Slam entry at #108. He was, of course, the #1 seed here and defeated Matteo Viola (31, #264, Italy) in the final, 2 and 0. This is Marcel's 7th Challenger title to add to his 4 Tour titles. So here's something interesting: last week saw a W25* in Hong Kong won by 15-year-old Ukrainian Daria Lopatetska. This week... well... we have a W25 in Hong Kong that was won by 15-year-old Ukrainian Daria Lopatetska. Yes, these were two different tournaments. Oddly, Lopatetska's reward for winning last week's was to play qualifying to get into this week's (she didn't have to in the previous one). I don't understand tennis sometimes. This time, Lopatetska defeated a fellow Qualifier, China's Shuyue Ma (19, #929). Yes, her opponent is barely in the Top 1000. Holy crap. Lopatetska is up to #365. There were also two W15s last week, won by Vladica Babic (23, #?? ?, Montenegro) and Anastasiya Komardina (21, #540, Russia). Babic is ranked so low she doesn't even have a Current Ranking listed on the ITF website. Komardina was once as high as #172 and plays double-handed on both wings. - Rogerio Dutra Silva lost in Q1R of the AO to Dan Evans, 2 and 3, perhaps unsurprisingly. - Mikael Ymer has not played. - Anna Kalinskaya qualified for the AO and lost to Sabalenka in the first round. - You already know what Daria Lopatetska has been up to, lol. *NOTE: The ITF has rebranded their sub-Tour level women's tournaments. "W25" means it's a $25k, a "W15" a $15k, "W100" a $100k, etc, etc. Our only Challenger tournament of the week was won by Italian journeyman Gianluca Mager (24, #275), who had to do it the hard way, winning three 3-set matches, including in the final. His vanquished opponent was an even older and lower-ranked journeyman named Roberto Ortega-Olmedo (27, #323, Spain). Neither player had ever won a Challenger tournament, so a lot was on the line for them in the final. The first set went to ROO easily, but after losing an excruciating 2nd-set TB, Mager took over and won it, being the tougher of the two. Neither of them were seeded in the tournament, and in fact the only seed to even make the semis was 14th-seed Tallon Griekspoor (22, #233, Netherlands). Top seed Casper Ruud lost to Griekspoor and #2-seed Yannick Maden lost to runner-up ROO in the 3rd round. Unlike the men, the women were highly active last week with three W25s and two W15s. A familiar face won as the tournament's 2nd-seed: Urszula Radwanska! Formerly in the Top 30, her ranking dropped all the way outside the Top 500 by the end of 2017. She's now up to #317. This marks her first ITF title since 2012. Her opponent in the final was 6th-seed Ana Sofia Sanchez (24, #373, Mexico) who was attempting to get the highest level title of her career. She did manage to take Set 2 off Ula, 6-2, but was breadsticked in both of the other two sets. Amazing job by this little-known Indian! Despite having so many good seeds to get through, this is Raina's third career W25, so she does know how to win at this level. Could we see more of her? She is now the WTA's #1 ranked Indian! Also, for a W25, there were an awful lot of recognizable names here, including Buyukakcay, Allertova, and Nara. 6th-seed Anna Bondar (21, #272, Hungary) upset top-seed Francoise Abanda (21, #221, Canada) in three epic sets 6-7, 7-6, 7-5! That looks like it was an excellent final. This is Bondar's 2nd career W25 and makes her Hungary's #3 player. Bondar defeated the tournament's 2-seed Grace Min (24, #238, USA). She also defeated in the 2nd round one of my sentimental favorite players, Ann Li, who I was privileged to watch in the 2017 Wimbledon Junior finals. In the W15s, Anastasiya Komardina won for the 2nd week in a row, not dropping a set, even winning the final with the loss of only 1 game. And the other W15 has yet to wrap up, with the final between Ipek Oz (19, #723, Turkey) and Zhibek Kulambayeva (18, #?? ?, Kazakhstan) starting in a few minutes. - Hubert Hurkackz lost in the first round of the AO to Ivo Karlovic in 4 tiebreak sets. - Jeffrey John Wolfe seems to be taking time off to celebrate his huge win from last week. - Marcel Granollers lost in straights in Round 1 of the AO to Marius Copil. - Lopatetska is resting after her two titles and 12 wins in a row to start 2019. - Vladica Babic lost in the 2nd round of Petit-Bourgue. 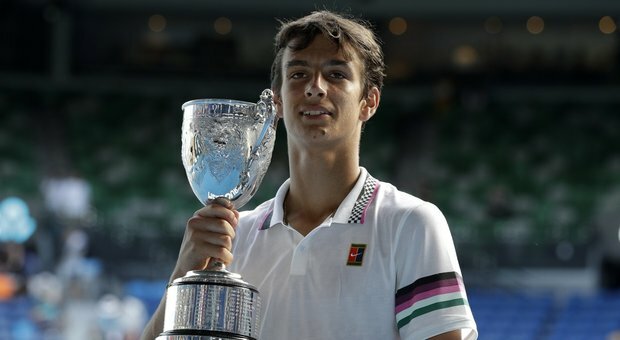 16-year-old Italian Lorenzo Musetti, the #1 seed at the AO Boys tournament, defeated 13th-seed American Emilio Nava (17) in the final here in 3 sets. It was the first time in the whole tournament Musetti had to go to 3. Musetti was the runner up at the 2018 USO Boys tourney and came good on his #1 seeding here. His Junior ranking is #2 in the world now, and Nava is up to #5. Let's look to see what these two can do on clay at the French this summer. #1 seed Clara Tauson (16, Denmark) began the tournament by dropping the first set she played 6-1. After that, she didn't drop a single set and was only forced to play one tiebreaker (2nd round) all the way to the final, where she defeated 4th-seed Leylah Annie Fernandez (16, Canada) 4 and 3. Tauson is current Junior #1 and finished 3rd at last year's Junior Masters Final. Unlike other girls her age, Leylah Annie (awesome name) is actually fairly active in pro ITF tournaments and has a WTA ranking inside the Top 500. Her Junior ranking is #5. What can we expect from these two promising young women? Last year's champ and #1 seed Taylor Fritz defended his title here, defeating 16-seed Brayden Schnur (23, #164, Canada) in the final. It wasn't easy for Fritz, who dropped his first set of the tournament to Marcos Giron (already a Challenger champ in 2019) 6-2. After that, though, Fritz got his imposing serve clicking. Schnur was very impressive during the week, defeating #3-seed MacKenzie McDonald and in the semis an unseeded Donald Young. Due to withdrawal there was no #2 seed, so Shnur actually had to play both of the highest ranked players in the tournament. A name most of us are familiar with won this one as the tourney's 4th-seed: Thiago Monteiro (24, #107, Brazil). Previously as high as #74, this is only Monteiro's 2nd Challenger title. He didn't drop a set until the final, where he defeated Facundo Arguello (26, #193, Argentina) in three. Arguello had previously beaten the #2-seed Juan Ignacio Londero (25, #112, Argentina) in the quarters, and actually beat Facundo Bagnis in the semis, making it officially the most fertile semifinal yet seen on the Challenger tour. #1 seed Guido Andreozzi lost his first match to Emilio Gomez (27, #330, Ecuador). Gomez went on to make the semis, losing to Monteiro. Longtime journeyman Steven Diez (27, #307, Canada) won this tournament out of nowhere, needing to use his ITF World Tennis Ranking to even get entry to the draw (whatever that means). He was actually out of the Top 400 before winning this, and this is his first ever title at this level! Amazing! Diez was pushed to 3 in his first two matches, but then settled in after that and didn't drop another set. He defeated unseeded Aussie Maverick Banes (26, #265) in the final. Banes has the distinction of having one of the coolest names ever. He also defeated the tourney's #2 seed Lloyd Harris (21, #111, South Africa) in the 2nd round. #1 seed Mirza Basic lost in the 3rd to #16-seed Jay Clarke (20, #212, Great Britain). You're not going to believe this, but Ricardas Berankis won this tournament. Could he have actually remembered how to play tennis after all this time? Once in the Top 50 (barely), Berankis came in as this tournament's #4-seed and he didn't even SNIFF a challenge the entire time, winning every set he played in 10 games or less. He defeated #14-seed Antoine Hoang (23, #145, France) in the final in front of the partisan French crowd. Unlike Berankis, Hoang didn't have it easy, having to play three 3-setters in a row to make the final. Berankis is now 4 rankings spots away from being back in the Top 100. #1-seed Adrian Mannarino lost his first match here to unseeded Jurij Rodionov (19, #197, Austria) while #2-seed Benoit Paire retired with injury in the QFs to Yannick Maden (29, #122, Germany). On-fire young Canadian Bianca Andreescu (18, #68) not only won this tournament, but in winning it has won 16/18 matches she has played in 2019. That is a truly staggering number to achieve BEFORE FEBRUARY. Winning her semi against Tatjana Maria in a 3rd set TB, Andreescu was bageled in the first set of the final before turning things around to win. Her victim in the final was American Jessica Pegula (24, #104) who flew through the draw before hitting a wall in the final. Pegula even defeated #1 seed Rebecca Peterson in the quarters. This is Andreescu's biggest career title and she is barreling towards the Top 50. While awesomely-named Maverick Banes may not quite have gotten home glory here on the men's side, unfortunately-named Qualifier Belinda Woolcock (24, #378) did the job for the home crowd on the women's side! 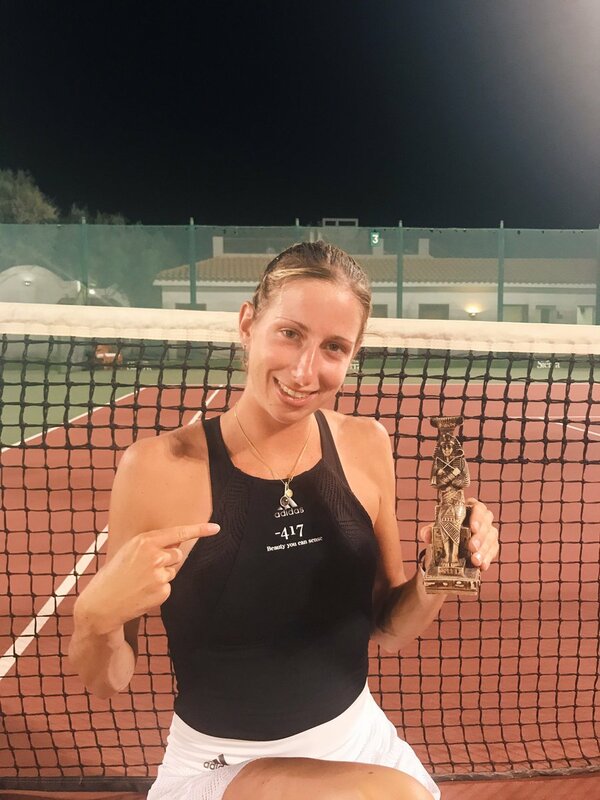 So low ranked she had to qualify, Belinda went on to achieve BY FAR the best result of her career, winning her first ever pro ITF singles title! And a W60 at that. She defeated #8-seed Viktoriya Tomova along the way and won the final in two TBs against #6-seed Paula Badosa Gibert. #1 seed Sara Sorribes Tormo lost in the semis to Gibert. We almost got ANOTHER Qualifier champion at last week's second W60, but unseeded Slovakian Rebecca Sramkova (22, #190) held off plucky French underdog Audrey Albie (24, #306) in three sets to win it. Albie has two W15 titles to her name, both in 2017, while this is Sramkova's 8th ITF title of her career, and the second largest (she won a W100 in 2016). However, Sramkova did have to get more than a little lucky to win this one, facing a Qualifier in the final and having the #1-seed, Polona Hercog, retire with injury in their semifinal match. 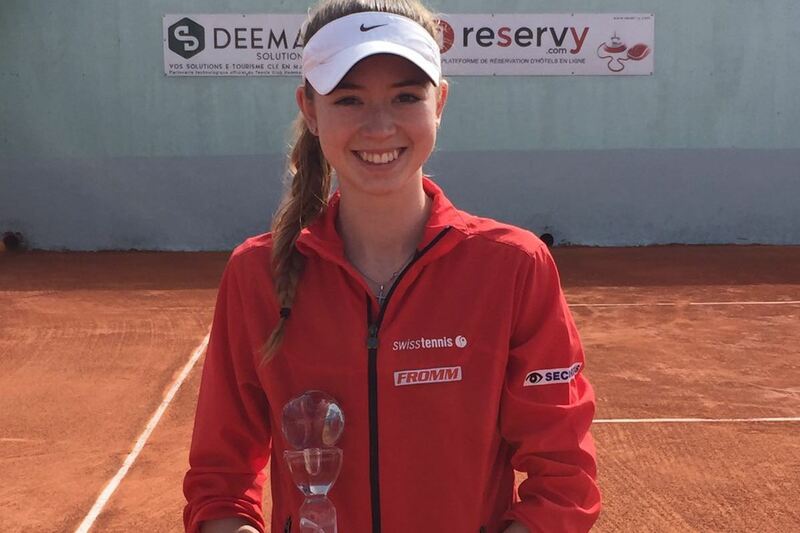 Won by Varvara Flink (22, #203, Russia), making this her 6th ITF title and second at this level. Flink was #2-seed here and her opponent, #7-seed Anastasia Gasanova (19, #315, Russia) retired in the final. A low-level, Russian tournament with two Russians in the final and one of them retires. Hmm. Won by Lin Zhu (25, #118, China). This is her 10th ITF title and first of 2019. She has three W60 titles to her name. Zhu was #2-seed here and defeated unseeded Korean Han Na-Lae (26, #222) in the final. Won by Hailey Baptiste (17, #416, USA). 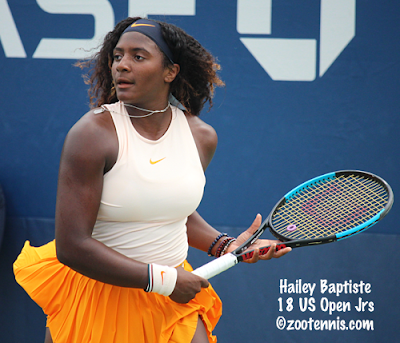 Baptiste was a Qualifier here and defeated the 6th and 4th seeds on the way to the final where she beat #5-seed Anna Bondar (21, #239, Hungary). This is the very first ITF title of young Baptiste's career, all the more impressive when you remember that Bondar just won a W25 close by here last week, in Daytona Beach, Florida. Yes, there were two Romanian W15 champs last week and both of them had "Ioana" in their names. Weird. - Ula Radwanska lost in the first round of Newport Beach to Kristie Ahn. - Ankita Raina lost in the second round of Singapore(4) after her title run in Singapore(3). She also lost in the 2nd round of Hua Hin qualies. - I mentioned Anna Bondar above, who lost in the final of Plantation to Hailey Baptiste. - Anastasiya Komardina's W15 winning streak finally came to an end in the 2nd round of Monastir(3). Very nice, Arvis! Thanks for doing it! It’s an education! Thanks Arvis for making it so readable and interesting. Thanks guys, I do enjoy it, although my format means it takes quite a bit of time. But it's fun getting to know some of these players. I fell off it in 2018, but in 2017 I was able to "meet" Mihaela Buzarnescu very early in her career renaissance as I saw her winning all kinds of ITF tourneys before she burst onto the Tour level. And of course, my favorite women's player of them all is Claire Liu, who still plays at this level mostly. So it's fun to follow this stuff. We have another cool Cinderlla tale here in the Challengers, as yet another Qualifier goes on to win the title. This time it was a player who wasn't even inside the Top 500! His name is Maxime Cressy, and you can tell from his name that he's French.... but actually he is an American and plays under the United States flag. He's 21 and just jumped over 200 ranking spot with this trophy, up to #313. Cressy started 2019 having never even PLAYED in a Challenger tournament, and losing his first match of the year, BADLY and in a Futures tourney, 1 and 4. But something changed after that, because he Qualified for Newport Beach last week (losing to eventual finalist Schnur in R2) and even won his R1 match there in dominant fashion. Now, he qualifies here and goes on to take the title! An absolutely amazing result for this young man. He even beat Tim Smyczek and on-fire Marcos Giron along the way. His opponent in the final here was Mikael Torpegaard (24, #262, Denmark) who has now lost two Challenger finals in a row, both to unknown American players. Those are the only tournaments "Torpedo" Torpegaard has played this year, too, so he's 10-2 on the year in Challengers. He played really well here, too, defeating 2-seed Miomir Kecmanovic (19, #118, Serbia) and Challenger expert Darian King (26, #161, Barbados) on his way to the final. Elsewhere in the draw, 1-seed Jason Jung (29, #123, Taipei) lost his first match to previously-reported-on Jeffrey John Wolfe aka The Other Unknown American That Torpegaard Lost A Final To In 2019. Gregoire Barrere (24, #131, France) made the home crowd happy here, winning the trophy as 15-seed. He won his first match in a 3rd-set TB and then had a tough match in R3 against 1-seed Hubert Hurkackz, but HH faded in the 3rd set. After that Barrere settled in and didn't drop another set until the final. This is Barrere's 2nd Challenger title of his career. And who should be across the net from him in the final but Dan "The Doper" Evans? Evans is trying to reboot his career and has been playing quite well in 2019. But his run to the final here was anything but easy: he literally had to win three 3rd-set TBs IN A ROW before the semifinals. And yet, win them he did. Evans' ranking is already back up to 147. In this world of Qualifiers winning tournaments, here's one tournament where the 1-seed actually takes care of business and wins the whole thing. Ladies (lady?) and gentlemen, I give you the Launceston champ and newest addition to the ATP Top 100: Lloyd Harris (21, #100, South Africa)! Harris not only won as the 1-seed, but he didn't drop a set on his way to the title, even defeating the runner-up, Lorenzo Giustino (27, #187, Italy) 2 and 2. Harris only had to play one TB the entire week, too, against Spain's young Nicola Kuhn (18, #237). This is Harris' 3rd career Challenger title. Will we see him make a little noise on the Tour level this year? Giustino was the 12-seed here and got a bit lucky in the QFs, as he was losing to Jay Clarke but Clarke got injured and had to retire. Clarke had beaten the 2-seed Tatsuma Ito (30, #140, Japan) in the previous round. - And at last annihilated 4-seed Jessica Pegula (a finalist last week, too) 2 and 4 in the final. No sets lost. No TBs. Defeated 1, 3, 4, and 5 seeds. All I can say is watch out for this girl. A title at the W100 level is literally only two levels below WTA 280, so this is a big deal and a big result. After starting the year with a runner-up finish in Playford and then slumping for a couple weeks, Elena Rybakina (19, #196, Kazakhstan) put it all back together and went one better, getting the title here. The only other ITF title she had previously was a W15 last year. This surely indicates that she's on the rise. She also defeated 1-seed Laura Siegemund in R2. However, although Rybakina was winning the match, her opponent, 4-seed Irina Khromacheva (23, #131, Russia), retired in the final, making this the second week in a row with a Russian player retiring in a championship match. 2-seed Nao Hibino lost in the QFs to Arina Rodionova (29, #159, Australia). Japanese journeywoman Miharu Imanishi (26, #405) got her 4th career W25 here last week. Her first title at this level came in 2013 when she was only 20, but she's never broken through to any higher level trophies. Once as high #187, Imanishi will be looking to get back into the Top 300 this year. She was 7-seed here. She defeated Jodie Anna Burrage (19, #416, Britain) in the final. Burrage hadn't dropped a set in the tournament and was a 3:1 favorite over Imanishi, but looks like she couldn't maintain the steady play that got her there. She has never won a tournament at this level, but has two W15 trophies to her name. - Berankis, dominant in Renne, lost in straights in R1 Quimper and also in QR1 in Montpellier. Back to his usual self. Those not listed here did not play, which is most of them. Good stuff thanks Arvis, always interesting to read about new names coming through. "the most fertile semifinal yet"
ABSOlutely love it Arvis! Super entertaining read and highly informative - must take hours to put together. So, Torpegaard tropedoed again... I love it! Incidentally I saw Lloyd Harris play the challenger here in Vancouver a couple summers ago and the guy is a stick - seriously, he makes Djokovic look like Jabba. These write ups are so amazing and awesome, Arvis! I love how you notice the trends and follow up on 'where are they now'. Serious respect for you! Yeah, if you click on Lloyd Harris' name there's a pic, and you can tell that he's a gangly toothpick. #1-seed and Top 100 player, Mackenzie "MacMac" McDonald, was a mere TB away from winning this entire tournament without dropping a set. And yet, he played poorly in the 2nd set TB in the final and faded away, losing the tournament to unheralded American journeyman Mitchell Kreuger (25, #160), who #14-seed in the tourney. This is Krueger's first ever Challenger title and it gets him 110 ATP ranking points, veritably launching him straight into the Top 200 and achieving his highest career ranking. Great moment for this 25-year-old grinder! #2-seed Ryan Harrison quit the tournament with injury before playing a single point, but too late to allow for a LL to take his place. What a douche! The #1-seed (Ramkumar Ramanathan, 24, #128, India) and the #2-seed (Lukas Rosol) both lost their first matches here. So who took advantage and got the win? #8-seed Alexander Bublik (21, #144, Kazakhstan) of course! The 6'5" (196cm) Kazakh had a rough go in his early matches, but then he seemed to really settle in, winning his SF and Final matches with the loss of only 6 games total between them. His opponent in the final was older veteran journeyman from Italy named Roberto Marcora (29, #254), who was unseeded and kinda came out of nowhere. He beat the #5 and #6 seeds here, including last week's Quimper champ, Gregoire Barrere. This would have been Marcora's first Challenger title, but instead Bublik made it his 4th. We were so close to a #1-vs-#2 final here, but unseeded Aussie Andrew Harris (24, #326) shocked the tourney's #1-seed and hometown boy Prajnesh Gunneswaran (29, #97, India) in the semifinals. Although he lost in the final, this is gets Harris to his highest ever ranking. This means that the actual champ here, though, was #2-seed Corentin Moutet (19, #131, France) who seems to be a very promising teen! This is already his 3rd Challenger title and gets him to 8-2 at this level for 2019. His career-high rank is 105. Can he be a rare Top 100 in his teens? He has until April to do it. Vitalia Diatchenko (28, #127, Russia) was the #1-seed here and aklmost 100 ranking spots above the next highest ranking player. However, she handled her business by winning the cup, although she did struggle in her early matches. Once as high as #71 in the world, Diatchenko has one 125k title to her name, as well as two W100s. This marks her 7th W25 singles title. She defeated qualifier Harmony Tan (21, #301, France) in the final, 1 and 4. Former Top 50 player Lucie Hradecka (33, #456, Czech) is attempting something of a comeback in 2019. She won a match each in Brisbane and AO qualies, but couldn't do more. So she decided to enter this W25, where she not only qualified, but won the tournament! It has been 5 years since Hradecka won a title, and that was also a W25, so this is a great sign for her late-career comeback. She defeated Kristina Kucova (28, #277, Slovakia) in the final in a 3rd-set TB. Beautiful delivery, Arvis, that was an ace! Swiss journeyman Henri Laaksonen (26, #121) is truly in better form than he's been in in years. He didn't let his painfully-close losses in Davis Cup discourage him, but rather he brought a confidence into this Challenger tourney that saw him take the trophy. And he defeated well-known names along the way: Stephane Robert, Thiemo de Bakker, Go Soeda, James Duckworth, and finally at the end a resurgent Dudi Sela. This makes Challenger trophy #4 for Henri, who was seeded #3 here. #2 seed Tatsuma Ito retired with injury, to Sela, in the semis, while #1 seed Gunneswaran lost his opening match to unseeded American JC Aragone. In a shocking twist of Challenger competence, new Cherbourg champ Ugo Humbert (20, #75, France) not only won this tournament as the #1 seed, but did it by defeating other seeded players in every match besides his opener and the final! Even then, his final opponent was Steve Darcis (34, #283, Belgium) who is playing really well this year and also defeated every possible high seed on his way to the final (including #2 seed Yannick Maden and #3 seed Stefano Travaglia). While he's still struggling to make a mark on the Tour level, this makes Humbert's 4th Challenger trophy and he's not even 21. While last week's Grenoble champ Vitalia Diatchenko (28, #97, Russia) far outranked her opponents there, entering the tournament seems to have been the right choice. She fought through some yips in the early rounds there before rounding into form to take the cup, and the result was that she had a much easier time winning here at the more lucrative Shewsbury tournament. She was #2 seed here and yet didn't drop a set until the final, where she came back from a set down to defeat #1 seed Yanina Wickmayer. This gets Diatchenko into the Top 100 again and brings her impressive title count up to a whopping 16. There are rumors that she is dating our very own TennisElbow, so we all have a rooting interest here. While last week's Trnava W25 was won by a familiar face, this one had two unseeded players competing in the final. 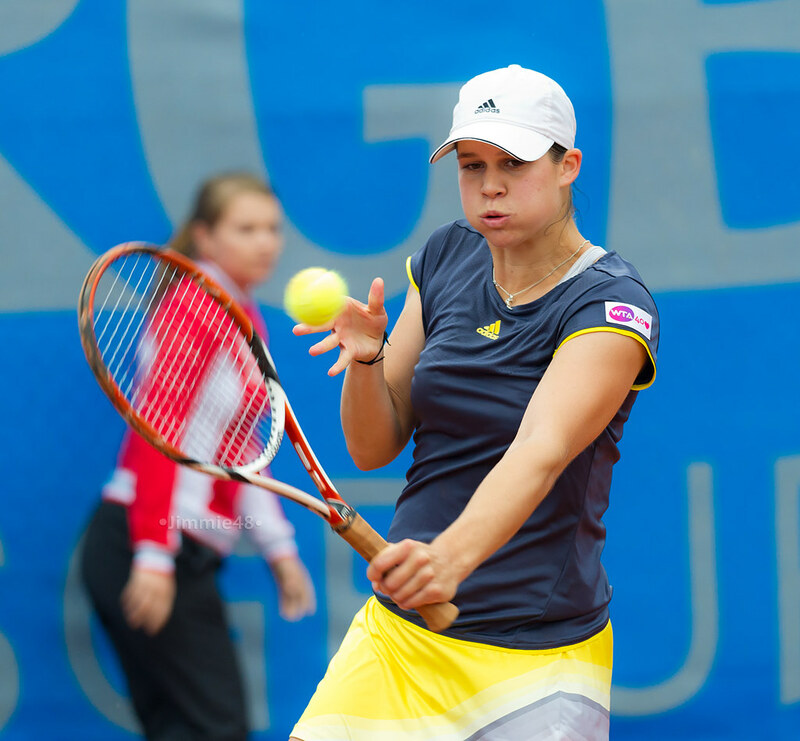 The result was Isabella Shinikova (27, #253, Bulgaria) quite easily defeating Denisa Allertova (25, #363, Czech). You may remember Allertova, as she was once close to Top 50. She seems to have had injury struggles. Shinikova was once as high as #133. This makes five W25 titles in Shinikova's career, winning ALL of the other four in 2016 alone. Perhaps she can replicate her 2016 campaign in 2019? Or maybe do better? Our winner here has been on the pro tennis scene for so long, and so notably, that her highest ranking was #35 back in 2005. At the time she achieved the #35 ranking, our runner up had not even been born yet. 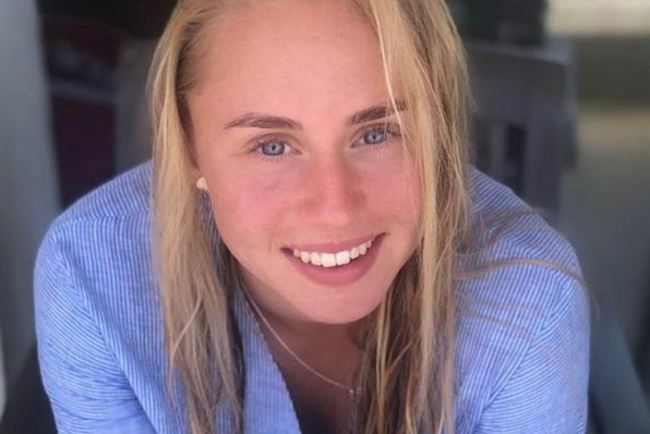 Sesil Karatantcheva (29, #232, Bulgaria) defeated 14-year-old American Cori "Coco" Gauff (#579) in three sets to take her first title since 2017, and only her second title in the past 7 years. As much of a story as that is, Gauff is really what's impressive here. At her tender age and low ranking, she got into the draw as a special "Junior Entry". Despite this, she defeated the #4 and #8 seeds, as well as Olga Govortsova in the semis. She even took a set off Sesil in the final. 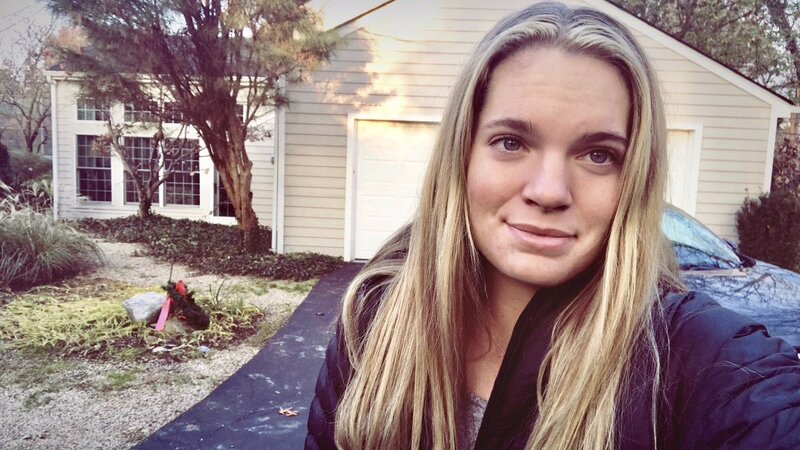 I really think this young lady is the next big thing in the future of the WTA. - Lulu Sun (17, #552, Switzerland, born in New Zealand, acquainted with both Tono and Adunar, probably?). First career title, dropped no sets, lost no more than 4 games in a set. - Anna Morgina (27, #611, Russia). 12th career title, literally all twelve have come in Sharm El Sheikh, Egypt. Do note that there are several Sharm El Sheikh tournaments every year. - Kamilla Rakhimova (17, #?? ?, Russia). First career title. Won 16 pro matches last year, already up to 6 wins this year. - Marta Lesniak (30, #?? ?, Poland). This is her 10th career title, with her first two coming in 2004, and the other eight coming after 2016. Apparently she quit tennis after 2005 because of some injuries and didn't officially restart her career until 11 years later. Incredible. - Maryna Chernyshova (19, #569, Ukraine). 7th career title, 8-1 match record on the year. - Alexander Bublik lost his opener in Cherbourg but is set to play his opener in Bergamo tomorrow. - Corentin Moutet lost his opener in Bangkok. - Vitalia Diatchenko won another tournament (see above)! - Lucie Hradecka qualified for Dubai but lost in R1 to Belinda Bencic. - Yuki Naito lost in a W15 final to Maryna Chernyshova (see above), but then finally ran out of gas at another W15 this week, losing in R1 in a 3rd-set TB. - Lara Michel lost in R1 of another W15. But you're right, Gauff is super-exciting! incredible success at her age! That is crazy about Morgina - does she live in Sharm El Sheikh? LOL, the Diatchenko thing was a joke to get TE's attention. Sorry. But yes, if you click on Morgina's name it'll take you to her Instagram where she mentions being "Made in Russia, Produced in Egypt", whatever that means. But it still seems like she'd have SOME title somewhere else by now! For further laughs, check her Doubles titles. She has like 30 or something and less than 10 are outside of Sharm El Sheikh! Really curious what Lesniak could have done had she stuck with her pro career. She obviously has some real talent. I just happened to be in Shrewsbury that week on business. Personal business. If you know what I mean. Lulu Sun, born in NZ eh, can't say I bumped into her at all, but congrats to Lulu anyway.